The Pew Research Center recently released some numbers about the diversity of religious groups in the United States. To measure diversity, they gauge how evenly divided each religious group among 5 racial and ethnic groups in the United States: whites, blacks, Latinos, Asians, and “other”. If each of the 5 racial groups account for one-fifth (20 percent) of the larger religious group the score is a perfect 10. The most diverse groups are Seventh-Day Adventists, Muslims, Jehova’s Witnesses, Buddhists, and the Nones in that order. However, while the first four groups are the most diverse in the sense that most of their membership comes from racial and ethnic minorities, the Nones are the group that most closely reflects the demographic composition of the country. The score of the Nones is 6.9, 1.5 points lower than the 4th-ranked Buddhists but their racial distribution nearly matches that of the nation as a whole. Just a few years back, this was not the case, and there are still ways to go. Atheists and agnostics are still overwhelmingly white. Moreover, while the Pew post discusses racial diversity, this is not the only source of diversity. The group is still mostly male, though some progress has been made. It would have been nice to see how gender diversity could affect the rankings. 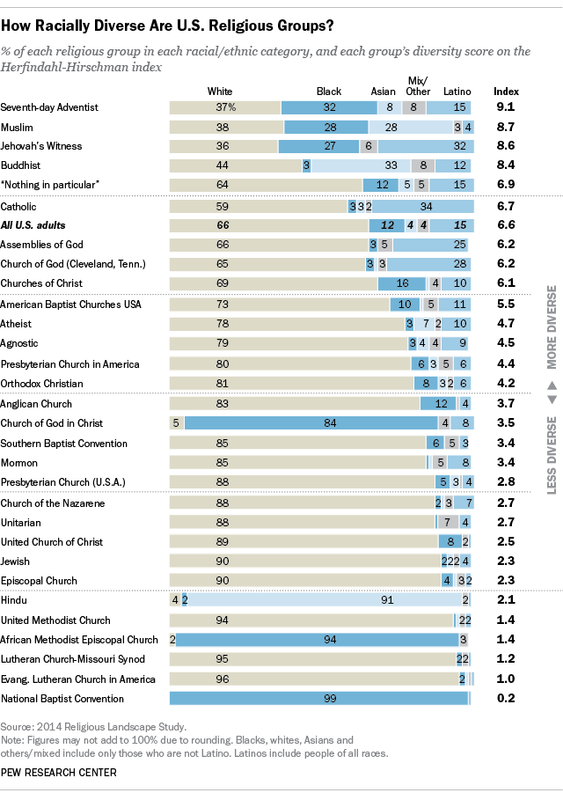 The good news about this chart is that the Nones are growing parallel to the general population. That was the subject of my first talk at the CFI leadership conference at the end of July and it is great to see it in an infographic. The group is drawing from the country’s racial diversity. In other words, the Nones look like America.